Do you enjoy event planning? Have you ever celebrated International Fanworks Day? 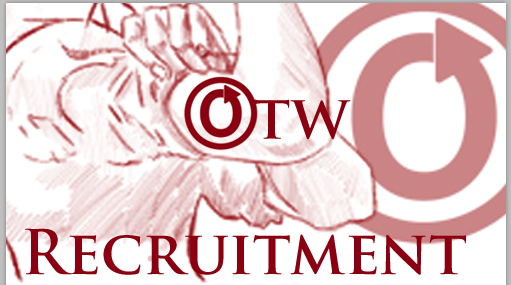 OTW Communications is looking for someone to help coordinate events large and small. The Communications committee is the central information distribution arm of the OTW, responsible for the distribution of information internally to OTW personnel and externally to the general public, the media, fans, and other fannish organizations. Usually, that information is news-related, but sometimes it’s celebration-related. The Event Coordinator is responsible for planning and executing organization-wide events throughout the year. Larger events include International Fanworks Day and the OTW’s anniversary. Smaller events include single-day celebrations such as SysAdmin Day. Would you like to help Fanlore reach more fans and get new editors? Do you have graphic design skills and enjoy creating social media content? If so, we need your help! The Fanlore team needs designers to create graphics and banners for Tumblr posts, tweets, and other Fanlore announcements, to help us reach more fans and potential editors. We have a lot of amazing fan history content, but we need your help to help others find out about it. If you think you might enjoy that, come and join us! If you’ve spent time figuring out how to make the Archive dance (or are willing to press the button to see what happens), are patient in the face of strange questions, can self-motivate, and are interested in helping your fellow fans, we would love to hear from you! The Support team is responsible for handling the feedback and requests for assistance we receive from users of the Archive. We answer users’ questions, help to resolve problems they’re experiencing, and pass on information to and from coders, testers, tag wranglers and other teams involved with the Archive. Applications will be accepted until Wednesday 13 June 2018 23:59 UTC or until 80 submissions have been received.